“She association circulars from Dunhuang.” In Antje Richter, ed., History of Chinese Epistolary Culture. (Handbuch der Orientalistik.) Leiden: Brill, 2015: 853–877. This is an article published in Antje Richter’s volume on the history of Chinese epistolary culture, which is a great book for anyone interested in letters. My own contribution to the volume deals with the association circulars (shesi zhuantie 社司轉帖) commonly found among the Dunhuang manuscripts. These are circulars typically sent out by the management of lay associations about upcoming meetings — they predominantly date from the 9-10th centuries. Although there have been several studies of these circulars by Chinese, Japanese and Russian scholars, little attention has been paid to the physical characteristics of these manuscripts, which is one of the aspects I address. This article about punctuation marks mainly in the Dunhuang manuscripts came out recently. It is sort of an inventory of the most important types of marks used in the manuscripts, although it is certainly not complete in its scope. Imre Galambos, “Punctuation marks in medieval Chinese manuscripts.” In Jörg Quenzer and Jan-Ulrich Sobisch, eds., Manuscript Cultures: Mapping the Field. Berlin, New York: de Gruyter: 341–357. Of these, Kirill Solonin could not be with us in person and we listened to his presentation via Skype. 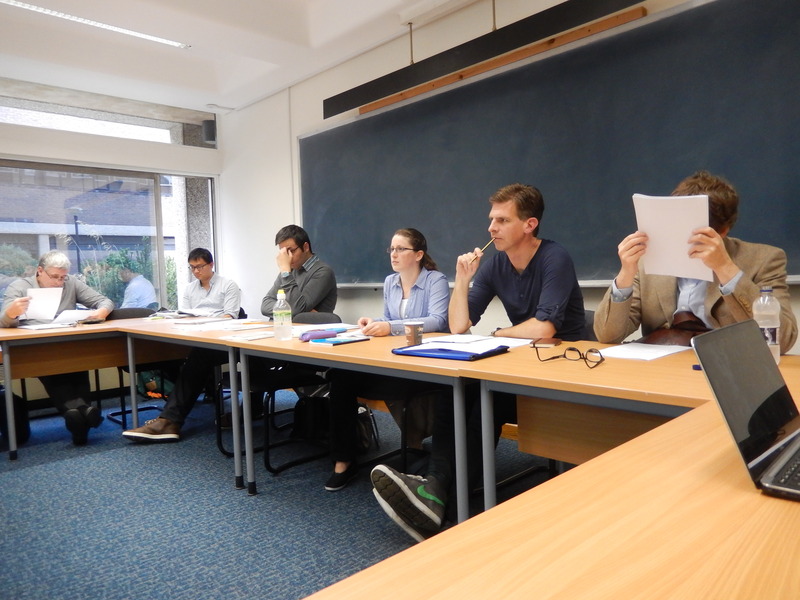 Non-presenting participants included Emma Goodliffe (IDP, British Library), Yang Fu (University of Cambridge) and Nathan Hill (SOAS), who had organised the last year’s Tangut workshop in London. 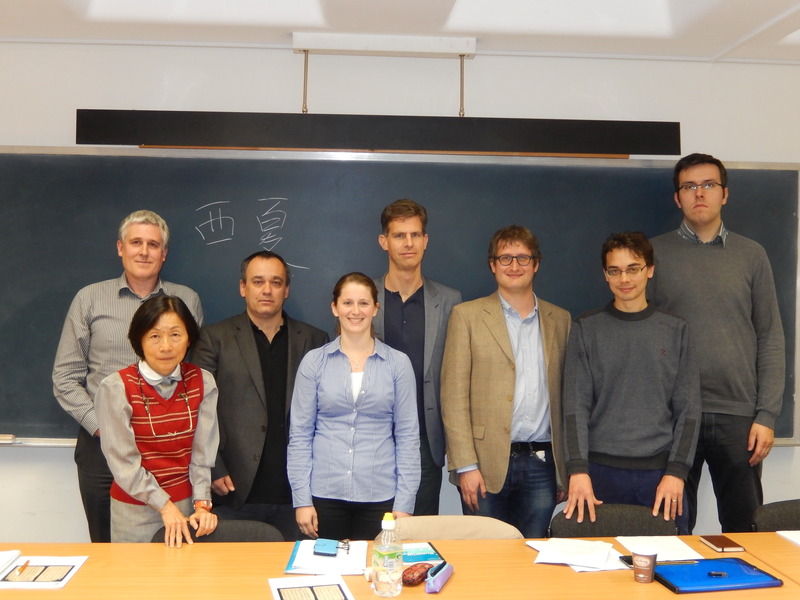 We hope that next year we will be able to hold the third Tangut workshop in Paris, thereby officially making this an annual event. Where the covering folds of the rolls were intact it was easy for Chiang Ssu-yeh to read off the title of the Sutra, the number of book and chapter, and anything else usually shown there. The information contained in those titles was of no guidance to me. The fact, however, that the headings of the rolls found in the first bundles were all different disposed of my apprehension that this great mass of manuscripts might be found to contain mainly an inane repetition of a few identical texts, after the fashion so widespread in modern Buddhism. At first I caused Chiang to prepare a rough list of titles; but as the Tao-shih gradually took more courage and brought out load after load of manuscript bundles for examination, all attempt even at the roughest cataloguing had to be abandoned. It is obvious that Stein here was not describing the entire cave library but only the manuscripts brought out to him for inspection by Abbot Wang. But even these ones turned out to be too numerous to be able to catalogue. 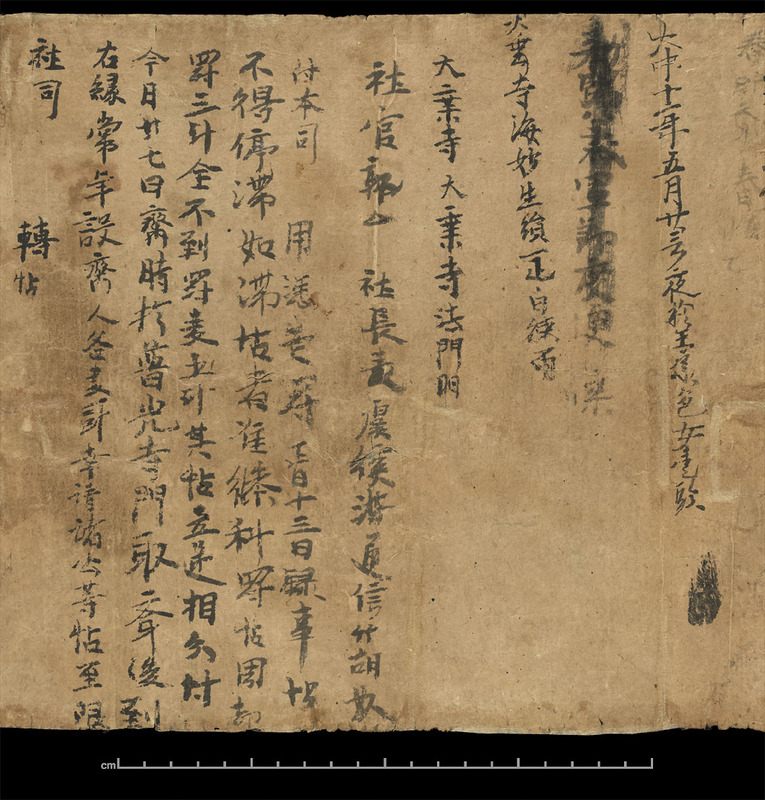 Yet when we examine the manuscripts of the Stein collection today, we can see that many manuscripts contain numbers and notes written on the verso by Stein’s secretary Chiang Ssu-yeh (aka Jiang Xiaowan 蒋孝琬). The titles are usually accompanied by strange-looking numbers. These are the so-called Suzhou numerals 蘇州碼子 or Huama 花碼, a traditional numeral system commonly used up to the Republican era in accounting and for other number-intensive tasks. Apparently, Jiang Xiaowan assigned the scrolls a number which he often augmented with the text’s title or a rough description on the outside of the scroll. Jiang’s description sometimes consisted of only a number and the title of the work, as in S.101 which is a fragmentary copy of the Fomingjing 佛名經 (Fig. 1). We can see that the red Suzhou numbers were subsequently written out in Arabic numberals in pencil (in this case 465), possibly by Jiang for the sake of Stein, or perhaps by Stein himself. 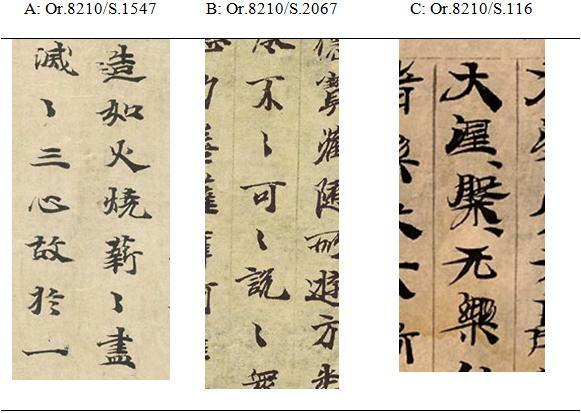 Yet the Stein number of this manuscript is S.101 which is different from the 465 assigned to it by Jiang. In other cases, the manuscript would only have been given a number, without a title or any other comment (e.g. S.112). Apparently, Jiang did not have much time to work with the material, nor was he particularly familiar with Buddhist texts. This is why some of his descriptions are rather rudimentary, such as in the case of S.111 on which he simply wrote “no title given” 未載名字 (Fig. 2). Indeed, the text, which seems to be a dhāraṇī, bears no title. 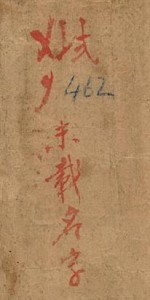 In other cases, Jiang also included a note on the condition of the manuscript. Thus on the verso of S.1286 we read the note “A worn-out piece [i.e. fragment] of the Fomingjing” 破爛佛名經一塊 (Fig. 4). This description is obviously neither scientific nor entirely accurate but it shows on Jiang’s part an occasional effort to label the manuscripts he identified and numbered with more than just the original title. Particularly interesting is Jiang’s description of non-Chinese manuscripts, since at the time these were beyond the general knowledge of Chinese intellectuals. Thus on the verso of manuscript IOL Khot S 1, which has the Lotus sutra on the recto and fragmentary Khotanese texts on the verso, Jiang wrote that this was a “half-Indian Miaofa lianhua jing” 半印度文妙法蓮華經. He also writes on IOL Khot S 4 that the manuscript is “half Chinese, half Indian” 半漢半印度文, showing little awareness of the language seen on the manuscript which, of course, at the time, had not been deciphered yet. Yet Jiang’s comments are perhaps the very first remarks on Khotanese texts by a Chinese intellectual. Jiang’s numbers and notes can be seen on many manuscripts in the Stein collection. I have not counted how many manuscripts are marked this way but it must be hundreds. While this is obviously a long cry from the entire collection, it nevertheless represents an important part of it. We would have to assume that these manuscripts were those Abbot Wang brought to Stein first and which Jiang Xiaowan tried to identify before giving up the project altogether as unrealistic. Yet Jiang’s numbers and notes are certainly catalogue data and if we took the time and effort to gather them together, we would have in hand the first ever catalogue of Dunhuang manuscripts, even if it covers only a relatively small portion of the corpus. You can purchase the book here. The page is unfortunately in Hungarian but they may put up an English version sometime soon. The price is marked as EUR 40 + shipping. 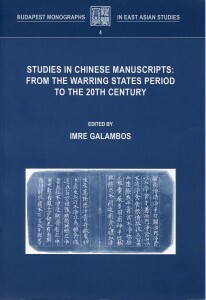 Imre Galambos, ed., Studies in Chinese Manuscripts. Abbot Wang, also known as Wang daoshi or Wang Tao-shih, is one of the most infamous figures in the history of Chinese archaeology. He was the Taoist priest (i.e. daoshi) who stayed at the Mogao Caves near Dunhuang, taking care of the Buddhist temple complex when Aurel Stein visited the site in the autumn of 1907. In 1900 Wang had found in one of the caves a hidden chamber filled to the ceiling with ancient manuscripts and silk paintings. It has become a legend how Stein convinced the priest to part with tens of thousands of scrolls in exchange for a modest donation towards the restoration of the temples. A few months after this the French sinologist Paul Pelliot appeared on the scene and was able to acquire another sizeable collection, which was, on account of his competence as a sinologist, in many ways superior to that of Stein. Next came the Japanese and later the Russian expeditions, each taking home collections of manuscripts. Although at the time there was little animosity towards either foreign explorers or Abbot Wang, with the rise of patriotic sentiments in the late 1920s, the transactions in retrospect received an increasing amount of negative publicity. As a result, Stein was branded a thief who deprived the country of an important piece of its national heritage, whereas Abbot Wang was perceived by the public as either a traitor who sold out his country to foreigners or simply a fool. 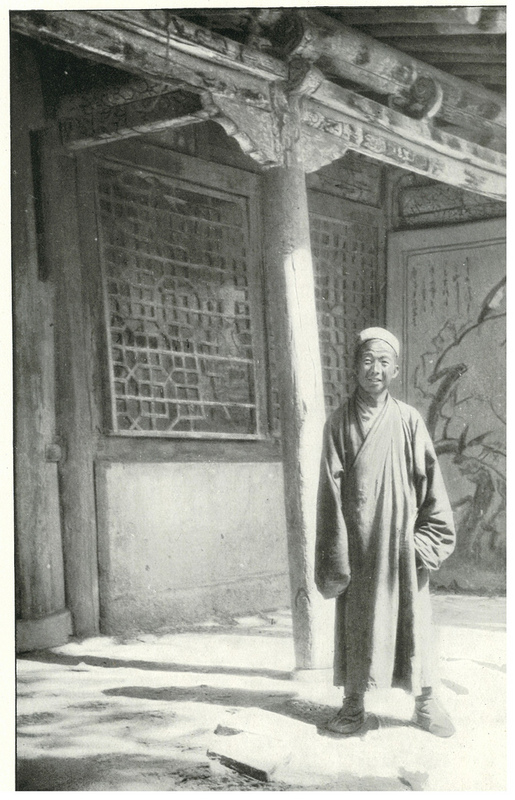 In a photograph taken by Stein at the Mogao Caves (Serindia, Oxford: Clarendon, 1921, vol. II, p. 804) Abbot Wang does appear in a rather unflattering way, albeit perfectly friendly. His stance, clothes and expression all suggest a simple-minded person (see Fig. 1). Fig. 1. 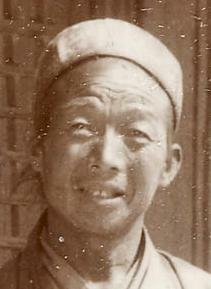 Abbot Wang (Wang Tao-shih) in Serindia, vol. II. Ironically, in this passage Stein criticizes Abbot Wang for his ignorance of “traditional Chinese scholarship”, of which he himself was even more ignorant, not even being able to speak any Chinese at the time. (Learning from the experience of the brilliant French sinologist Paul Pelliot, in later years Stein grew to understand the PR value of being able to speak Chinese to local officials and has made several attempts to learn Chinese.) We can also hardly blame the Abbot for not sharing Stein’s colonial eagerness to secure these “first-hand materials for historical and antiquarian research” and move them to Europe. In any case, rather than writing a defence for Abbot Wang, I wanted to add to the public record two portraits from among Stein’s photographs which may help to add a human dimension to the simplistic image that currently prevails. The first one is actually from the same photo shown above, only zoomed in so that we can see the priest’s facial features. The other one is more or less unknown to the general public, cropped from a larger image where the Abbot appears only on the side. Abbot Wang in Dunhuang -- British Library: Photo 392/26(327). 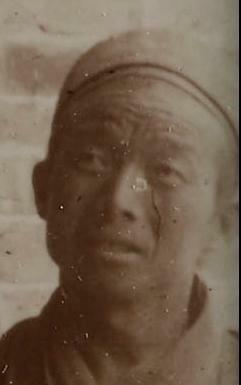 Abbot Wang -- British Library: Photo 392/26(322). I just received a hard copy of this paper and am putting it up a PDF so it is more accessible. The paper is about the young English boy who travelled with Tachibana Zuicho to Western China in 1910 on an archaeological expedition, and who appears in Peter Hopkirk’s book Foreign Devils on the Silk Road as “A. O. Hobbs.” Although almost nothing was known about him, I managed to dig up some additional information, including his family background and some forgotten details about the expeditions. Imre Galambos. “An English boy in Chinese Turkestan: The story of Orlando Hobbs”. Studia Orientalia Slovaca 10/1 (2011), pp. 81-98. Galambos, Imre. 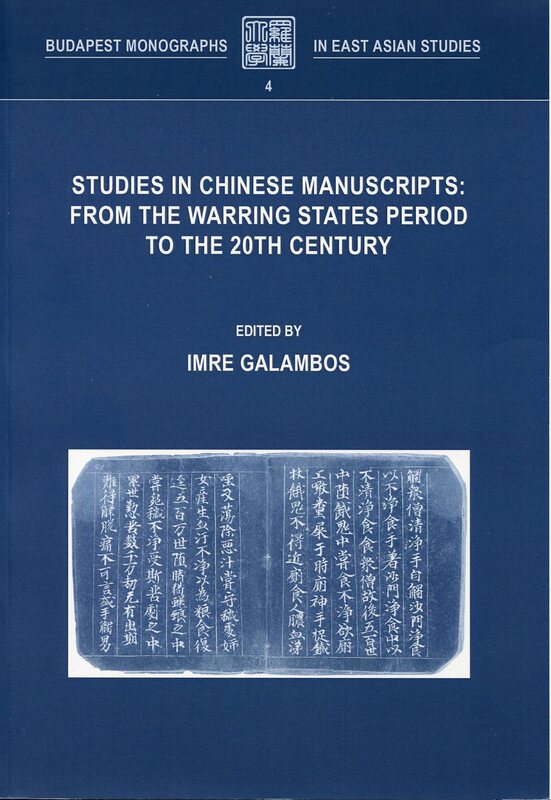 “Consistency in Tangut Translations of Chinese Military Texts“. In: Irina Popova ed., Tanguty v Tsentral’noj Azii: Sbornik stat’ej v chest’ 80-letija prof. E. I. Kychanova [Tanguts in Central Asia: a collection of articles marking the 80th anniversary of Prof. E. I. Kychanov]. Moscow: Oriental Literature. 84-96. 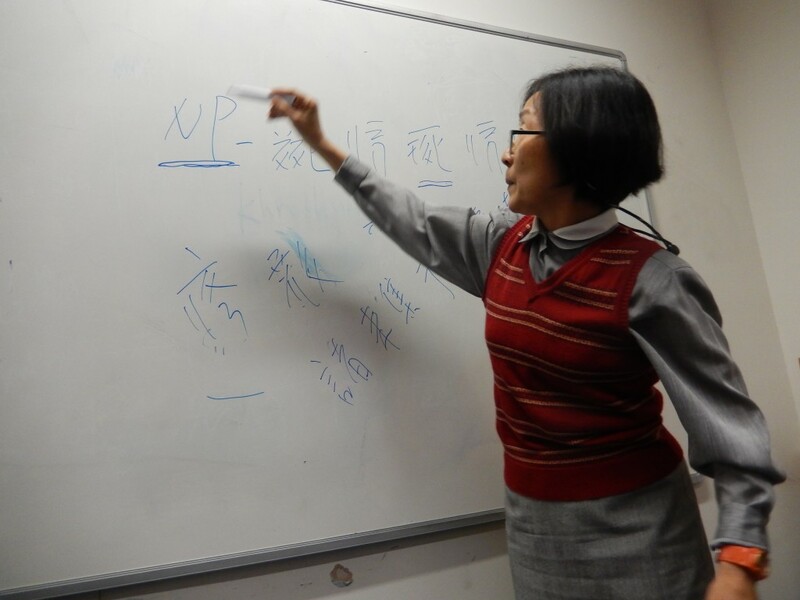 This is a paper about how consistently terms and names used in Chinese military texts (e.g. Sunzi 孫子, Litao 六韜) appeared in Tangut translations of these texts. 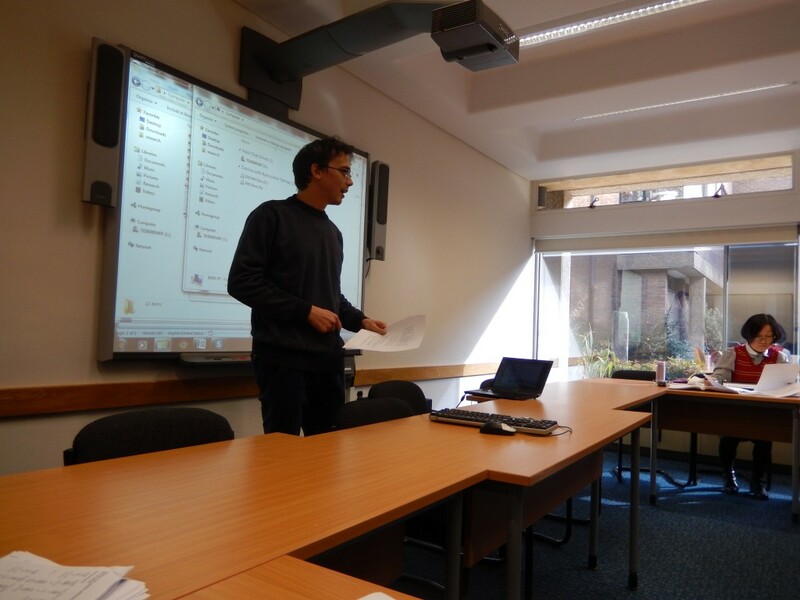 I argue that in a specialized genre such as Chinese works on military strategy, the shared terminology and the quotes and references between the texts works as a corpus builder, creating an intertextual network. In Tangut translations, however, we find very little evidence for such intertextuality because the terminology lacks consistency and even quotations from the Sunzi are translated diffently each time they appear. The reason for this is that there was no authoritative or standard translation in existence and when the Tangut translator came across a name or quote, he just translated it as part of the rest of the text, without looking up how this has been translated by others before, thereby severing the connections that held the Chinese corpus together.